Last summer, Agricultural Research Service (ARS) entomologist Jim Cane spent a week visiting alfalfa fields near the town of Touchet, in Walla Walla County, Washington. He wasn't scouting for insect threats or damage to the legume crop. Instead, he was collecting data on the alkali bee, a solitary, ground-nesting species that alfalfa seed growers count on for peak yields. Alfalfa seed is sold to grow premium hay for dairy cows and other livestock. Known scientifically as Nomia melanderi, the alkali bee is a champion pollinator when it comes to alfalfa flowers—even outperforming the respected honey bee. In fact, some Touchet farmers maintain parcels of open soil called "bee beds" to encourage female alkali bees to nest and raise their young, ensuring generations of pollinators and profitable seed yields for the future. Some of these sites have been maintained for more than 50 years, underscoring the insect's importance to local alfalfa growers. 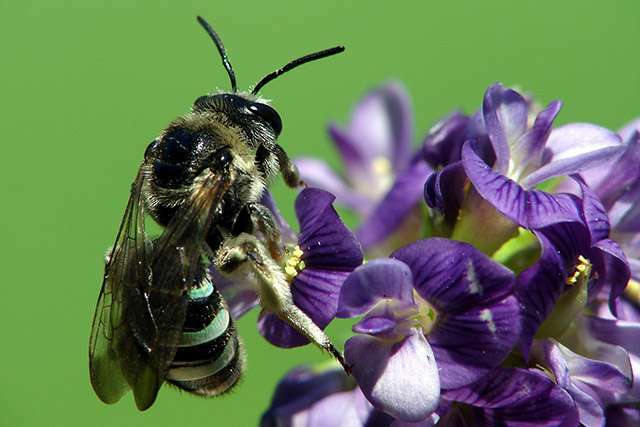 "Alkali bees from 1 acre of nesting bed—well populated—can readily pollinate 100 or more acres of alfalfa, for a crop of about 100,000 pounds of clean seed," says Cane, with the ARS Pollinating Insect-Biology, Management, Systematics Research Unit in Logan, Utah. In June 2016, Cane travelled from Logan to Touchet to learn more about the female bee's nesting requirements, especially her preferred soil-moisture levels. Cane teamed with Gaylon Campbell and other soil hydrology specialists from Decagon Instruments, located in Pullman, Washington. Together, they measured the flow of water vapor from the surrounding soils into the bee's underground tunnels and brood chambers. Each chamber houses one larva and a ball of pollen and nectar for it to eat as it grows and develops. Cane says female alkali bees are particular about where they'll nest, preferring, for example, moist basin-type soils with salty surfaces. 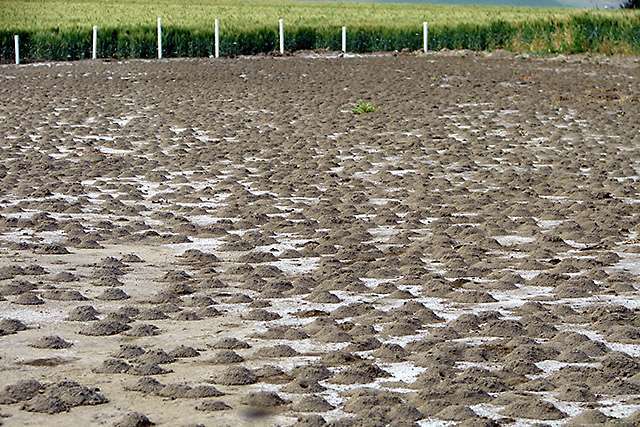 With Decagon's technical help, Cane hopes to acquire some hard science on the bee's soil-moisture needs so that alfalfa growers can manage their bee beds accordingly, whether that means using subirrigation or other methods. 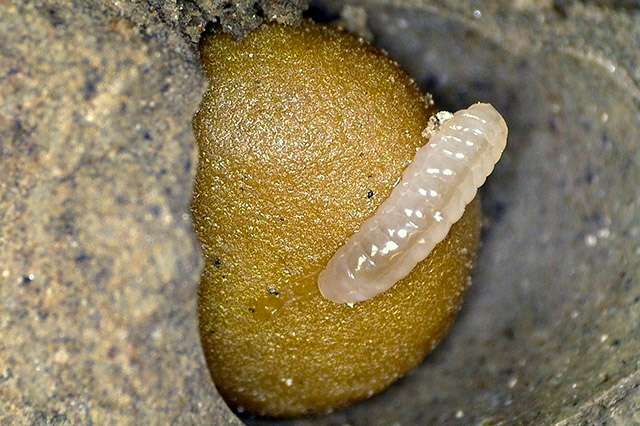 Larvae, for example, need enough moisture to keep from drying out in their chambers, but not so much that molds can grow on and ruin their pollen provisions, says Cane. In related work, Cane also examined the diet of the mother bee, showing that besides daylong foraging for pollen and nectar for her progeny, she also takes several pollen meals for herself. That paper, published in the March 2016 issue of Apidologie, "is the first to show for any nonsocial bee that the mother bee eats several pollen meals daily, to gain protein and fat enough to produce her large eggs," says Cane. The findings could help alfalfa seed growers avoid overstocking their bees and provide them with guidance on adding strips of an earlier blooming crop to feed young mother bees while they await alfalfa bloom.